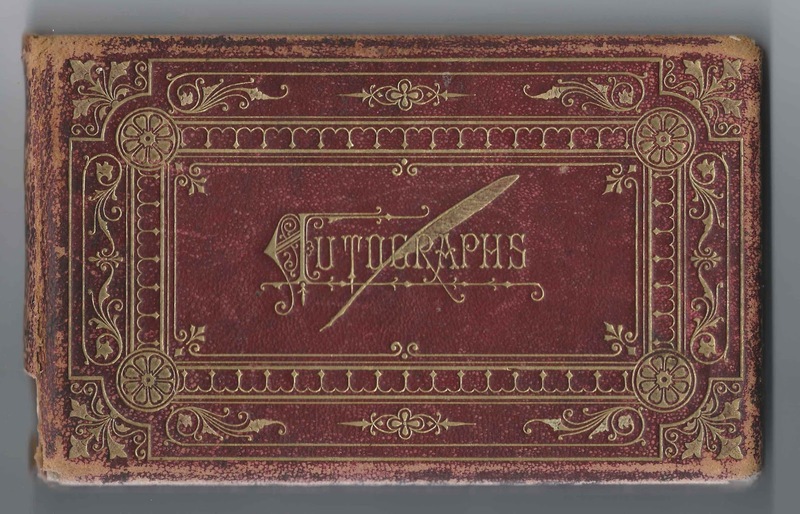 1870s/1880s autograph album of Frank E. Bramhall of Lowell, Massachusetts. 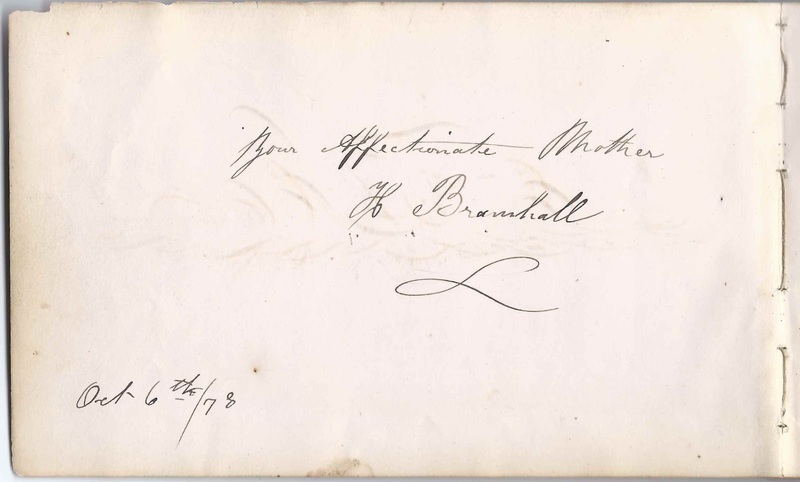 An earlier post featured the 1880s autograph album of Caroline Augusta Maynard, "Lina", whom Frank E. Bramhall would marry on June 3, 1885 at Lowell, Massachusetts. Many of Lina's autographs were collected while she was attending Lasell Seminary for Young Women at Auburndale, in Newton, Massachusetts. 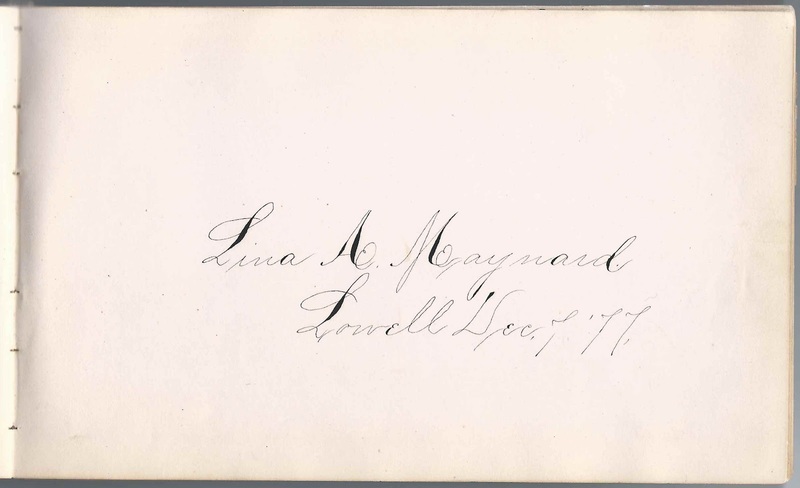 Lina signed a page in Frank's album at Lowell, Massachusetts, on December 7, 1877. Frank's album is approximately 8" x 6" and contains the sentiments of 65 of Frank's relatives, friends and classmates. Several of the signers indicated that they were students at Lowell High School, Lowell Commerical College or N.H.S. An alphabetical list of the signers, with residence and school affiliation, if any, appears at the end of this post. Frank E. Bramhall was born 20 September 1858 at Lowell, Massachusetts, the son of John and Hannah (Platt) Bramhall, who emigrated from England to Massachusetts. 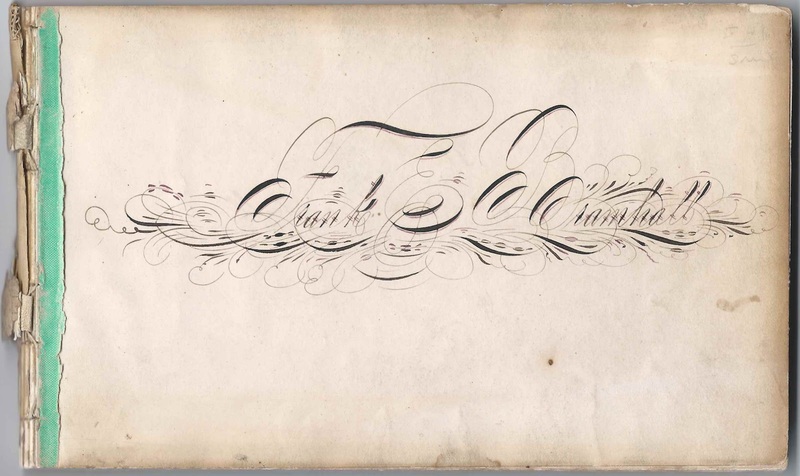 Frank's mother signed the page after the page signed by Frank himself, on October 6, 1878. At least two of Frank's cousins signed pages in his album. They were the children of Joseph Derbyshire and wife Sarah (Platt) Derbyshire, older sister of Frank's mother Hannah (Platt) Bramhall. 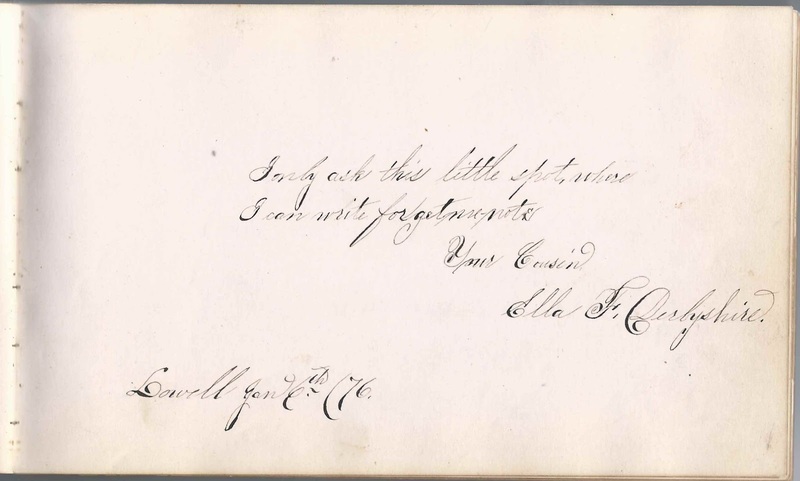 Ella F. Derbyshire signed a page at Lowell, Massachusetts, and called herself Frank's cousin. One of Ella's brothers was Alfred William Derbyshire, presumably the A. W. Derbyshire who signed two pages in Frank's album, one on February 1, 1876, and the other on July 5, 1878. As noted above, on June 3, 1885 at Lowell, Massachusetts, Frank E. Bramhall married Caroline Augusta Maynard, "Lina", daughter of Caleb J. W. Maynard and May (Wheeler) Maynard. Lina was born February 17, 1861 at Lowell, Massachusetts. Frank and Lina raised a family of three, two daughters and a son, at Lowell, Massachusetts, where Frank ran a printing business. Lina died in 1928, and Frank in 1935. E. B. Bacheller, signed at Lowell, Massachusetts, on October 1, 1876 "N.H.S., A.B.C." 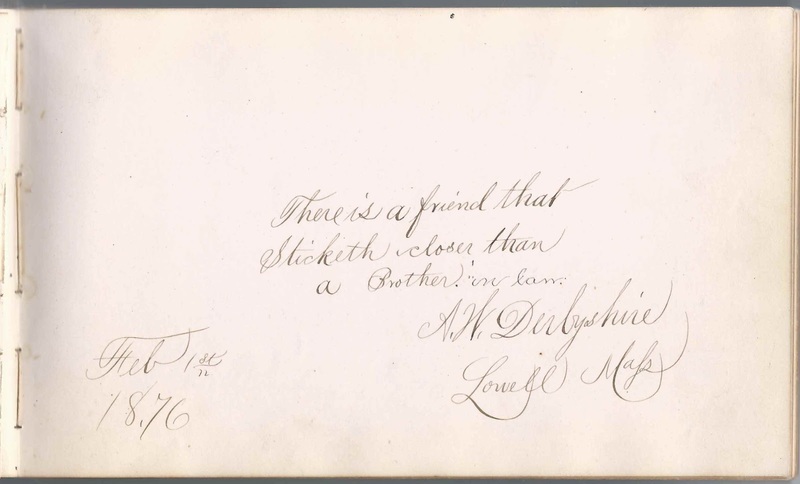 Fred Burnham of Lowell, Massachusetts, signed on March 29, 1878; middle initial possibly A. 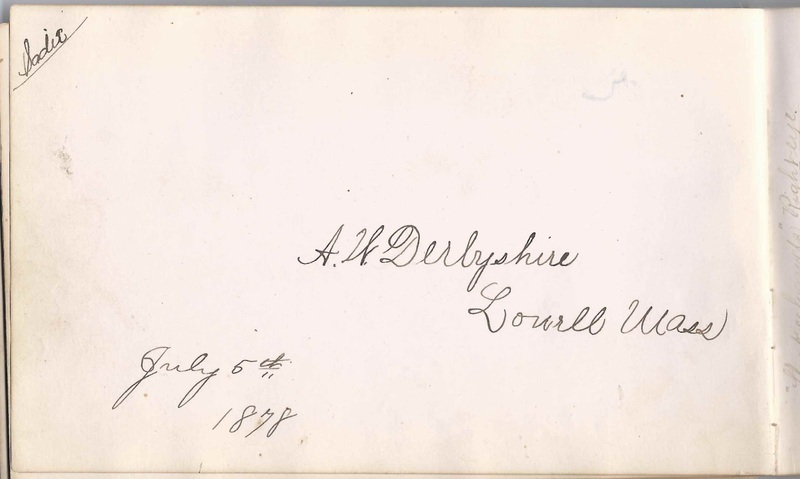 A. W. Derbyshire of Lowell, Massachusetts, signed on February 1, 1876 and July 5, 1878; Albert William Derbyshire, brother of signer Ella F. Derbyshire and son of Sarah (Platt) Derbyshire, a sister of Frank E. Bramhall's mother Hannah (Platt) Bramhall. Ella F. Derbyshire, signed at Lowell, Massachusetts, on January 6, 1876. "Your Cousin". Brother of signer Albert William Derbyshire and daughter of Sarah (Platt) Derbyshire, sister of Frank E. Bramhall's mother Hannah (Platt) Bramhall. Herbert W. Horn of Lawrence, Massachusetts, signed on March 28, 1878. "Party from Salsbury Beach" "G. W." "P.D. on A.T."
Emma Lovejoy of Lowell, Massachusetts, signed on October 31, 1878; not sure of middle initial. Charles A. Mitchell, signed at Lowell, Massachusetts, on July 14, 1877. "Red and blue, A.B.C., July 6, 1877"
Alice Parker, signed at Lowell, Massachusetts, on March 6, 1878. "O.Y.B., March 4, 1878" "M.B. Meeting"
Capitola Pillsbury of Farmington, Maine, signed on March 13, 1879. "One of the sifters"; "your cousin?" Charles S. Shepard, "Le Diable", of Lowell, Massachusetts, signed at July 3 & 4, 1878. N.H.S. Emma J. Stratton of Lowell, Massachusetts, signed on May 2, 1876. "Edson School"
Hattie E. Woodward, signed at Lowell, Massachusetts, on December 14, 1877. Among many other messages: "P.W.B.K.S.O. ", or "P.W.B.R.S.O."